Check our facebook page for the latest, things change pretty fast. Honey Tripel is similar to a Belgian monastery style tripel but with Massachusetts made honey instead of the more commonly used sugar. Sugar is used in this style to keep the body light and the finish dry. Honey does the same thing but adds some great aromatics. The hops stay in the background to let the honey and yeast-derived flavors come through. The barley and wheat malts are almost entirely Massachusetts made and most of the hops are Massachusetts grown too. HoneyTripel is available in 22 oz bottles and on draft. ABV is 8.8%. IBUs are about 20. Color is golden. BTW - you can pronounce it however you want, but tripel sounds the same as "triple" when we say it. 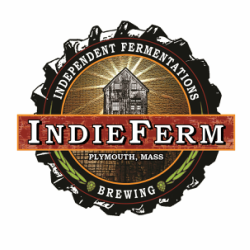 ​Rye and Sage Saison was originally brewed for the wedding of friends of IndieFerm who are conveniently named Ry and Sage. It came out great so we keep making it. There is rye and sage in the beer as well as a bit of lemon zest. It has more body and a bit darker color than a typical saison but is still very easy-drinking. ABV is 6% and the IBUs are about 30. ​Boat For Sale Pale Ale is a modern American pale ale with tropical fruit aromas. It's a pale orange color and loaded with hop flavors while not being too bitter. We use mostly New England made malted barley and rye and Massachusetts grown nugget and cascade hops. There is some citra and azacca in there as well but those aren't grown locally. Black Feather Porter is named in honor of Black Feather Horse Rescue in Plymouth and all the work they do caring for neglected animals. This is a straight-ahead Porter with notes of coffee and chocolate from the dark roasted malts. 5.8% ABV, 40 IBU. Old’s Cool IPA. Do you remember when IPA’s tasted like beer, not orange juice? Do you ever wonder what all that yucky haze is in your New England IPA? Now you don’t have to, we have brought back the classic American IPA old school style. Brewed and dry hopped with the 4 classic American C Hops (citra is not one of them). 6% ABV, 50 IBU. Hopshaker Pale Ale. A pale ale with cascade, citra, and chinook hops. Pine and citrus flavors are featured in this slightly hop-forward but balanced beer. Light bodied and easy drinking, very clean finish. 6% ABV, 40 IBU. ​Gratzer is kind of a weird beer. Gratzer is made using oak smoked wheat malt which gives it a mild smokey aroma. People ask us if there is bacon in the beer. There most emphatically is not! If you can imagine a Gose with smoke instead of salt, you are in the right ball park. ABV is 6% and the bitterness is mild. Color is a light gold. Gratzer is available in 22 oz bottles and on draft. A maple version was also released in the tap room only. Wait...what? IPA. Why make the same IPA as everyone else? We think that saison yeast makes a tasty New England Style IPA. Not especially bitter, but bursting with juicy hop aromas.